They have weak, patchy beards, and they want to learn exactly how to grow a beard faster naturally. But the problem is that once you type that into google, you are presented with hundreds of articles that barely scratch the surface, and usually, it's the same refurbished nonsense about eating more protein and drinking more water. Everyone with the slightest hint of understanding about beard growth and how it happens in men, realize that if you're genetically not able to grow a full beard, then drinking more water and eating little bit more protein, won't change the fact. You simply need something way more powerful and proven effective. Hundreds of men have posted their anecdotal before and after results after using minoxidil (Rogaine) to promote beard growth, and they all seem to support the fact that yes, Rogaine can be used on the face. Some years ago, when guys using minoxidil on their face was still kind of an underground thing, only couple forum discussions held the idea above the surface (mostly on Jeff's Beard Board). Nowadays, however, there's its own Reddit subcategory, multiple articles available online, and even a clinical study from Thailand which saw that minoxidil was effective for beard growth stimulation. The Derma Roller is a product intended for microneedling. It's a roll that contains hundreds of tiny needles, which work by puncturing the skin, causing "micro-damage" to the surface. This damage is harmless but prompts the body into healing it by shuttling fresh blood, nutrients, and hormones to the scene. 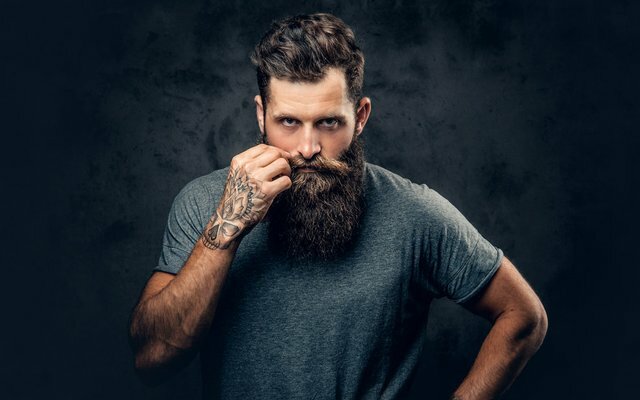 This can be good news for beard growth, as microneedling can promote circulation and androgen delivery to the facial hair follicles, thus enhancing natural growth rate. If you combine microneedling with minoxidil, it's like stimulating beard growth on steroids. Most beard growth products are bad. They are produced by guys who don't understand the difference between scalp-hair and facial hair, and they have no idea how to formulate a product specifically for growth. This is why many of the beard growth oils currently on the market are nothing more than over-priced 1 oz. bottles of poor-quality vegetable oils. If you truly want a beard growth oil, it's best to make one yourself. Easy, you need some hormone boosting saturated and monounsaturated fats and oils as the base, two proven testosterone boosting essential oils as scents, and some growth stimulating - androgen receptor agonist - compound like caffeine or carnitine. @alikuoppala purchased a 41.48% vote from @promobot on this post.